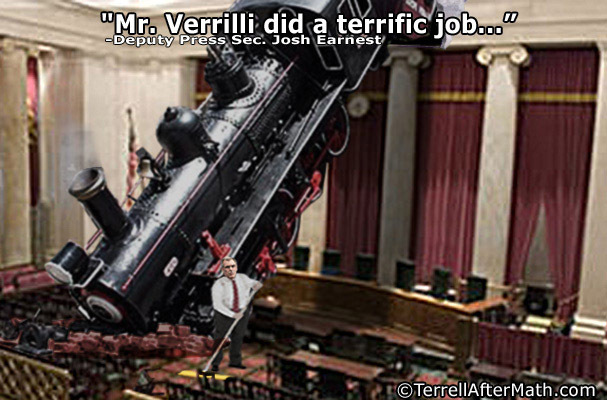 No crying and do-overs in Supreme Court appearances…I call him Milli Verrilli. Not to mention lipsynching the admin. Just noticed your comment before posting mine. I am slippin’ in my old age. Ooooohhh! The administration isn’t going to like this. That should be a solar-powered, high-speed train rather than an evil hydrocarbon-powered steam engine. Everyone knows that! Really? There was a glaring typo in the letter? Please let there be such an error. It’s perfectly fitting. That is horrific. I can only hope that those errors are the result of a cut and paste to the Fox website which caused them to appear and that they’re not in the source document. If they are, then the 5th Circuit should send it back as unintelligible and demand a corrected document. Must be an abundance of intellectual illiterates in the DOJ. Heard the other day that some journalism school in North Carolina dropped the spelling test required for graduation. The school said computers have spell checkers now, so it’s not necessary. This country is being dumbed down on purpose. Makes us more compliant you know. I agree–We are in post-education America. Or as Mark Levin calls it – “Ameritopia”. Well, it looks like the source document is not quite so eaten up with stupid. Here’s the scanned original that Forbes posted. Fox should have linked to the pdf rather than run the letter through the document reader. The pdf gives a whole different perception on their literacy. Not being well versed in legalese, I still don’t know what the DOJ is telling the court. I’m sure Mark Levin will interpret it tonight. All ABOard the Milli Verrilli ….